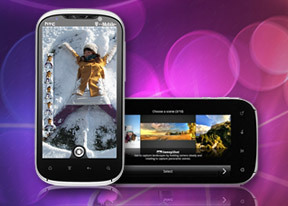 The HTC Amaze 4G has the latest Android 2.3.4 Gingerbread web browser, plenty of processing power and a large, high-res screen. The Vellamo benchmark result already gave us a hint about the serious performance on tap in this department. The user interface keeps mostly out of sight, which leaves the entire screen to the web page. The minimalist UI is still quite powerful – hit the menu key and six keys pop up. There are back and forward buttons, adding and viewing bookmarks and managing the open tabs. Finally, the More button brings out even more options – stuff like find on page and text selection (which works just like in the messaging app). The phone’s browser also supports double tap zooming and text reflow, which makes even longer texts extremely easy to read on the phone display. Without text reflow you will either have to zoom out until the text fits (but then it’s too small to read comfortably) or scroll sideways to read each line. Once you select some text, you can copy it, launch the Quick lookup app (which offers Google Translate among other things) or share the text over a message or social networking. The bookmark list shows a thumbnail view of the bookmarked pages and you get a “most visited” list in addition to the regular history. Tabs are displayed as 3D cards too – a really neat trick is that if you pinch zoom out beyond the minimum zoom level you go straight into the tab selector. This may be a cool way to manage tabs but too many of them open at once will seriously slow down the browser. The HTC Amaze 4G has full Flash support and YouTube videos up to 720p played quite smoothly. 1080p however proves too much for the browser and the video gets choppy. The usual set of organizer apps are aboard the HTC Amaze 4G, with a mobile Office app to boot that can both view and edit documents. The Polaris app has support for viewing Word, Excel, and PowerPoint, including the Office 2007 versions and it can create Office 2003 Word and Excel documents but not 2007 docs. Oddly, you can edit existing Office 2007 docs. There is also a PDF viewer to handle PDF files. The on-screen keyboard does cut down the available space in half but if you zoom out you can still fit a reasonable amount of text. This version of Polaris gives less editing options than we're used to - you can do copy, cut and paste, then apply bold, italic and underline styles and highlight text and that's it. There used to be font style options here but now they're inexplicably gone. You can't edit formulas in Excel spreadsheets either, which is a major stumbling block for doing Office document editing on the go. The calendar has five different types of view: daily, weekly, monthly, agenda and invitation. Adding a new event is quite straightforward and you can also set an alarm to serve as a reminder. The Agenda view shows a list of all the calendar entries from the recent past to the near future. Invitation only lists events with invitation info attached to them. The day view showing the weather forecast at the top of the screen is a nice touch. There is also a calculator aboard. It is nicely touch optimized with big, easy to hit buttons. Flipping it horizontally enables some more advanced functions like logarithms. The HTC Amaze 4G features an alarm clock application, which can handle multiple alarms, each with its own start and repeat time. The Desk clock app turns your Sensation into a… well, Desk clock. It displays the current time and date and allows you to switch off the display backlighting to save battery power or not disturb at night. The Stocks application gives you quotes from Yahoo finance. You can use the Stocks lockscreen too. The Voice recorder might be quite useful for making audio notes and the weather app brings Yahoo’s weather forecast for your area a click away. There’s an HTC-branded flashlight app too – it uses the LED flash and you can set it to 3 levels of intensity. Nice and all, but the Android Market is full of this kind of apps already. To top everything off, there is also a Zinio eBook reader preinstalled. It required you to set up an account and offers both books and magazines. The interface is simple and intuitive. With a 1.5GHz dual-core CPU and a powerful GPU, the HTC Amaze 4G can run every Android app designed for phones. The OS version is 2.3.4 so you won’t have any problems on that account either. After its recent major overhaul, the Android Market has become the place to go not only for apps and media, but also book, movies, etc. Its interface is simple and intuitive. The search function at the bottom right corner will assist you in finding anything you can possibly need.